Explanation: What creates the unusual tiger stripes on Saturn’s moon Enceladus? No one is sure. To help find out, scientists programmed the robotic Cassini spacecraft to dive right past the plume-spewing moon last week. 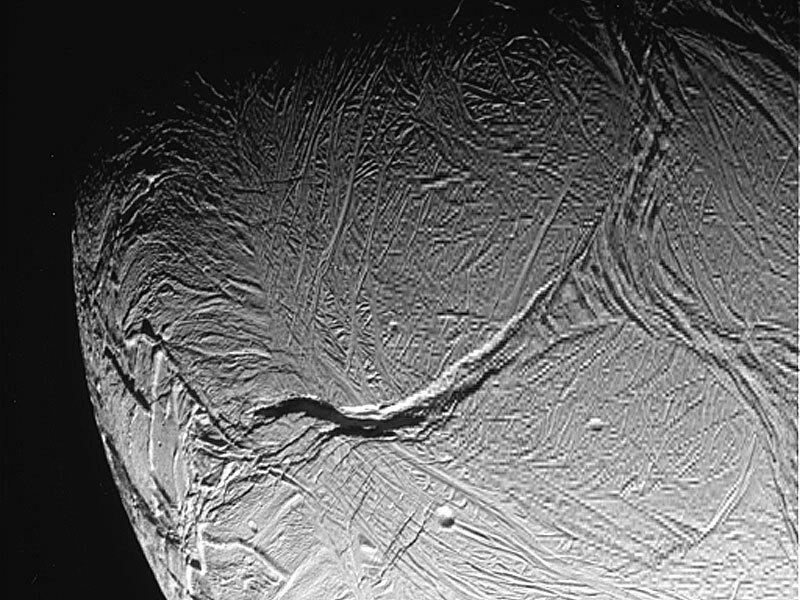 Previously, the tiger stripe regions were found to be expelling plumes of water-ice, fueling speculation that liquid seas might occur beneath Enceladus’ frozen exterior. Such seas are so interesting because they are candidates to contain extraterrestrial life. Important processes in tiger stripe formation may include heating from below and moonquakes. Visible above is terrain on Enceladus so young that only a few craters are visible. This newly released raw image shows at least one type of false artifact, however, as seeming chains of craters are not so evident in other concurrently released images of the same region. The large tiger stripe across the image middle is impressive not only for its length and breadth, but because a large internal shadow makes it also appear quite deep. Cassini will next fly by Enceladus on October 31.